It feels utterly nerdy and geeky to buy tickets for a train for no other reason than to ride that specific train. The image of a classic British anorak-wearing, bespectacled trainspotter was not far from my mind as Murph was buying our tickets for the Maglev to Shanghai’s Pudong airport. We weren’t flying out of the airport. We had no reason to go to the airport except to ride the train. 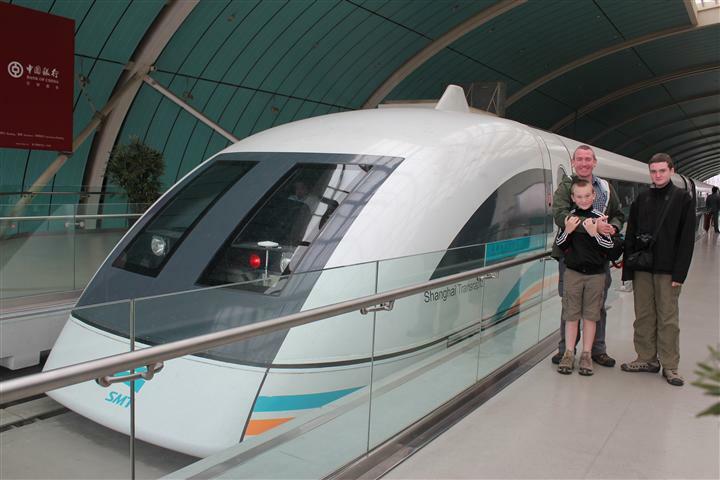 Other people go to art galleries and museums when they visit a city, riding the Maglev was top of our sightseeing to-do list for Shanghai. We had walked up and down the Bund admiring the old buildings which look as if they belong more in London or Paris than in a Chinese city. We’d checked out the temples and the tourist markets. We’d walked around Pudong, marveling at the skyscrapers and the now-iconic Pearl River Tower. Even the boys were impressed to learn that this whole area had been mostly agricultural land as recently as 1992. We’d even taken a sunset cruise on the Huangpu enjoying the views of the lit-up buildings, old and new on each side of the river. We saved the best until last. It doesn’t seem so long ago that a Magnetic Levitation train was a dream in a sci-fi writer’s eye. Now here we were, about to board and experience 431 km/h of levitating, super-conducting fun. The train accelerated from standing to top speed in three minutes and fifteen seconds and then cruised at 431km/h for just under a minute before starting it’s deceleration. A group of Italians in our carriage cheered as the train broke 200, then 300 then 400, their rowdiness making the short journey feel like an event. The train banks into turns a couple of times on the ride even at top speed, I’m not a fan of rollercoasters but this was exhilarating. Unlike a rollercoaster, in the Maglev’s plush, air-conditioned carriages you can’t feel the speed but you can feel the train tilt on the “rail” as the scenery outside whizzes by in a blur. I was glad we’d bought return tickets. We could have taken the metro back into town, but who knows when, if ever, we’ll go so fast again? This entry was posted in China, International Escapades and tagged China, China With Kids, Maglev train, Shanghai on April 19, 2011 by wandermom. Wow I am jealous. I already love your blog, but that is exactly what I would have wanted to do if I had made it to Shanghai! Fast trains are great. Love it! We ride public transportation just to ride, too, but nothing as cool as that, I think!